Ball items are easily available in Nepal Mithila Women Handicraft. Our colorful felt balls (pompoms) are completely hand made by our Nepali women by rubbing the felt round (in presence of soap and hot water: traditional method). It is very warm,versatile and Eco-friendly. Our colorful felt balls are very popular worldwide as it can be used to make different decorative crafts and accessories. It can be used to decorate your felt bags, felt purse, garlands, necklaces, children's rooms, Felt key rings, etc. and anything you can imagine creative in your mind. We offer our felt balls in various sizes and colors. The size of the ball is measured in diameter (cm). Currently we have 20 different color options. 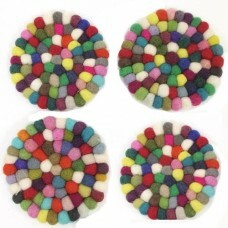 We do wholesale orders for felt ball, Felt round carpet(Rugs), Felt square ball carpet. We can customized felt carpet(rug) in your design and color combinations. Felt rugs(Carpet) are very soft and silk. They are safe and fit anywhere. All our felt rugs(Carpet) are hand stitched thoroughly by our Nepalese women. Felt rugs(Carpet) are very warm and adds extra beauty to your room with its beautiful color combinations and designs. We offer rectangular felt ball rugs(Carpet) in different color combinations and sizes. We also make custom rectangle felt ball rug(carpet) as per your color combination and size. Felt Ball CarpetFelt Ball carpet (Rug) is Hand Made In Nepal.First Ball is prepared from sheep woo.. It is one of the best selling item of our company. It looks more beautiful as it is made of cutting ..
Square Ball Tea coaster is Hand made In Nepal.First each ball is prepared and then ball is stitched ..
Ball Carpet (Rug) is Hand Made In Nepal.First Ball is prepared from sheep wool.Each felt ball is m..